How To Gain More Readers. If you know me in person, I am not a very organised person. I forget things so easily, I am hopeless at remembering dates and days! I have learnt to post ahead, I have about 15 scheduled posts up right now. Usually by the end of the first week of the month I have already got posts scheduled for the rest of the month. I never used to do this, but I have noticed I have gained more readers since having a new blog post up daily or every other day. I never used to be a fan of Twitter but one day I decided to look more into it, and I love it! Every morning I will have a look at my Twitter account. I try my best to remember to post my recent posts on Twitter and my Facebook page. I share my posts on Facebook groups related to Blogging. I do feel that this has helped a lot. I've always enjoyed linking up to linky's but I always used to forget to link up or I forgot which blog the linky was on. I now have a list in my notepad and on a blog page of all my favourite linkies, which you can see here. This has definitely played a big part in gaining more traffic. Every time I link up to a linky I comment on at least 3 or more blogs but if I know I have time, then I will comment on quite a lot! Sometimes up to 15 or more. Being a Blogger I think you need to show your support. All Bloggers should support each other. Be patient & Be yourself. 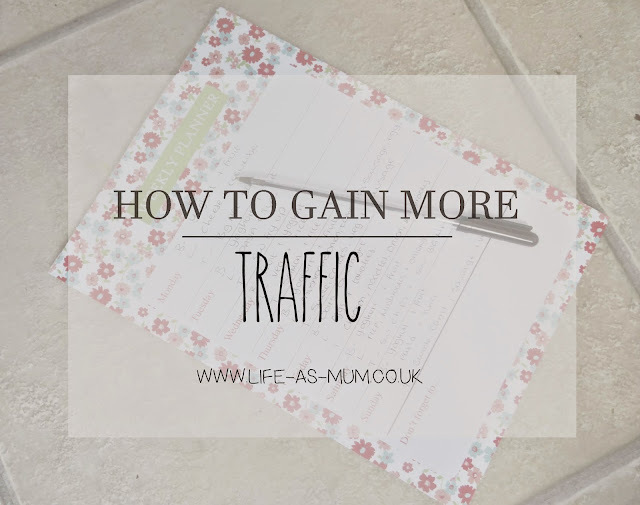 You can't gain more traffic overnight. You have to work hard, be patient and just be yourself. Still blog as you'd normally do and do all the things I said above and just be patient. Love this post, I have started to put more time into my blog and now just need to get more organised and be more social. I have twitter but always forget to post on it.